Wellington Youth Theatre (WYT) is a performance-based theatre company that empowers and encourages students to become individuals while working in a group environment in pursuit of shared goals. WYT provides the "Acting Antics" performance-based innovative skill-based program encompassing ‘Self Discovery through Performance™’ through the medium of live theatre. This will deliver an effective outcome that nurtures the individual, builds confidence, sharpens communication skills and improves knowledge while developing the use of ‘everyday’ language skills; all elements that help to build a future school and community “leaders”. A balanced education system is one that provides children with a curriculum that not only meets a child’s academic and intellectual needs but allows for and encourages personal, social and emotional development while developing the necessary life skills to assist a child to meet the challengers of today's learning environment. At WYT we are not just concerned with the process but with the final product. We believe in the importance of the learning process having an outcome. Goals need to be set and achieved. When a positive outcome is achieved under pressure, the excitement and exhilaration experienced is a joy for all involved. Children relish the opportunity to perform for others. Some times the anticipation of the performance is the most exciting part! 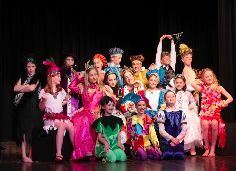 Acting Antics productions offer all students the opportunity to perform live, in costume and makeup for friends, family and the school community. Deborah’s broad career as an opera singer, musical theatre and cabaret performer, presenter, motivational speaker, keynote speaker, workshop tutor and drama/singing teacher has provided her with experience, knowledge and wisdom that has been the foundation stone for the development of the Acting Antics syllabus and concepts. Deborah has taught singing, drama and communication skills in many schools in New Zealand and Australia, some of the most prestigious being Hadlow Preparatory School, Solway College, Brighton Grammar School, Mentone Girls’ Grammar School and Wesley College. Deborah specializes in teaching vocal pedagogy, vocal development and technique, performance skills and audition & role preparation. Deborah is an experienced exponent of the Voicecraft and Estill methods of teaching and teaches both AMEB and VCE solo performance syllabus. Paul began his love of theatre at an early age, but writing and directing plays for children came later in life. Paul's inspiration has primarily come from his wife Deborah, who is the Founder/Artistic Director of Acting Antics International. Paul has amassed a large body of work that includes short stories and over 50 children’s plays and musicals. His work has been performed by theatre companies and schools in New Zealand, Australia, Singapore and Hong Kong. Acting Antics empowers students to explore, discover and participate in learning multi-faceted skills while experiencing real performance-based outcomes that are objective, meaningful and quantifiable. Acting Antics philosophy is to provide an innovative skill-based learning process encompassing ‘self-discovery through performance’ through the medium of stage that delivers an effective outcome that nurtures the individual, builds confidence, sharpens communication skills and improves knowledge while developing the use of ‘everyday’ language skills. All elements that help to build future school and community “leaders”.